It is true that the discovery of new knowledges and rapid advancement in sciences have enabled man to scale new frontiers in development and progress. However, at the same time, these very developments have created an environment where man is shackled by materialism. This materialistic approach to life has resulted in a situation wherein if man does not find any apparent benefit, rather any monetary benefit, in anything, he raises questions about its very purpose. In this intellectual environment, educated individuals often raise this question ? what is the benefit of remembering the event of Karbala, which occurred more than 1300 years ago? What is achieved by involving an entire community in mourning the event? Such questions and others like these are often raised in varying degrees and tones. We are Muslims. The verses of the Holy Quran and the traditions of the Holy Prophet (s.a.w.a.) and his progeny (a.s.) are a beacon of guidance for us. Therefore, all we need to see is how this deed of mourning (Azadaari) is dealt with in the light of the Holy Quran and traditions. The aim of life for any believer is attaining the satisfaction and pleasure of Almighty Allah and His Prophet (s.a.w.a.). This is possible only through the guidance offered by the Holy Quran. Hence, we present some thoughts below on this topic from the Holy Quran itself. Mourning: A Natural Effect of Our Nature The Holy Quran, while enumerating the incident of Firaun states, ?So wept not on them the heavens and the earth nor were they given respite?. (Surah Dukhan:29) The above verse indicates that the skies and the earth do shed tears. If this were not true, then the above verse would not have any meaning. The pages of history will testify that on the tragic martyrdom of Imam Husain (a.s.), the skies wept blood. The walls were stained with blood as well. Crimson blood erupted from beneath the stones. In addition, this condition persisted for a long time. For more details, one can refer to the history narrated by Ibn Asaakir (printed in Damascus), pp. 220-224. The Anglo Saxon Chronicle, written by a Christian in the year 1954, chronicles the events that transpired upon the people of Britain after Prophet Jesus (a.s.). In this book, under the year 675 (the year 675 is equivalent to the 61st year of the Muslim calendar), the author writes ? "In this year, the skies rained blood and in Britain, the milk and butter of the people turned into blood." (Pages 35, 37 and 42) Given that the author was probably unaware of the events that unfolded in Karbala in the same year, he has not provided any detailed explanation of the same. This however clarifies that the effect of the martyrdom of Imam Husain (a.s.) was not limited to Arabia. Rather it was felt all over the universe. Moreover, it should be so as Imam Husain (a.s.) was the Imam for the entire universe. Mourning: A Sign of Love The Holy Quran has ordained that the recompense for the efforts of the Holy Prophet (s.a.w.a.) is love and affection for his progeny (a.s.) The Holy Quran states, "That is of which God given glad tidings unto His servants who believe and do good deeds; Say you (O Mohammed), I demand not of you any recompense for it (the toils of the apostleship) save the love of my relatives; and whosoever earns good, We increase for his good therein, verily Allah is Oft-forgiving, the Most Grateful." The reward for the teachings of Holy Prophet (s.a.w.a.) is nothing but love and affection for his Ahle Bait (a.s.). And the teaching, which has reached us, includes Usul-e-deen (beliefs), Furu-e-deen (actions), morals and ethics, worship, social behavior, etc. Therefore, if a person accepts the noble religion of Islam, desires to follow its edicts and conduct himself in an acceptable way, it is imperative for him that he enlightens his heart with the love for Ahle Bait (a.s.) The Holy Quran has enumerated some of the signs of love. These are: (1) Obedience "Say: If you love Allah, then follow me; Allah will love you and forgive you your faults, and Allah is Forgiving, Merciful." (Surah Ale Imran:31) One of the measures of love is obedience. If love exists, then obedience will follow in the same measure and intensity as that of love. (2) Beauty of the Heart Love and affection are not expressed through mere words. Rather, it is deeply ingrained in one?s heart. It is through love that the heart is awakened. "... but Allah has endeared the faith to you and has made it seemly in your hearts, and He has made hateful to you unbelief and transgression and disobedience; these it is that are the followers of a right way." (Surah Hujraat: 7) Whomsoever Allah loves and keeps him dear, He grants him two bounties - One, he grants him the bounty of belief. For such a person, Allah creates a special attachment to belief in his heart. Then this very attachment serves as a cause for the obedience of divine laws. Secondly, Allah creates revulsion in his heart for sins, transgression and disbelief. This means that the love of Allah has two aspects - attachment to faith and detachment from disbelief, wrongdoing and sins. Sharing Happiness and Grief The Holy Quran, while narrating the Battle of Tabuk, has described the hypocrites as follows - Surah Taubah, verses 47-50. "Had they (the hypocrites) gone forth with you, they would not have added to you aught save corruption, and they would certainly have hurried about among you seeking (to sow) dissension among you, and among you there are those who hearken for their sake; and Allah knows the unjust. Certainly they sought (to sow) dissension before, and they meditated plots against you until the truth came, and Allah's commandment prevailed although they were averse (from it). And among them, there is he who says: Allow me and do not try me. Surely into trial have they already tumbled down, and most surely, hell encompasses the unbelievers.? Now kindly pay attention to the following verse and observe the conduct of the hypocrites. When the character of hypocrites is clear for us, then the signs of true believers will easily dawn upon us. "If good befalls you, it grieves them, and if hardship afflicts you, they say: Indeed, we had taken care of our affair before; and they turn back and are glad." The same aspect has been dealt with in the 120th verse of Surah Ale Imran, "If good befalls you, it grieves them, and if an evil afflicts you, they rejoice at it; and if you are patient and guard yourselves, their scheme will not injure you in any way..." From the above verses, it is evident that rejoicing at the misfortune of believers and mourning at their happiness are signs of a hypocrite. It also clarifies that being aggrieved at the grief of a believers and sharing his happiness are the signs of a believer. 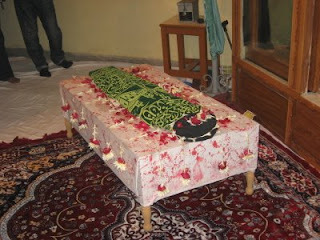 Mourning or Azadaari for Imam Husain (a.s.) is the physical representation of our love for him. Whenever a person who maintains the love of Ahle Bait (a.s.) in his heart, hears about their sorrow, then he surely too will be aggrieved. A tradition informs us, May Allah have mercy on our Shiahs! They have been created from our excess soil (Teenat), which has then been mixed with the essence of our mastership. They grieve for our grief and rejoice for our joys. 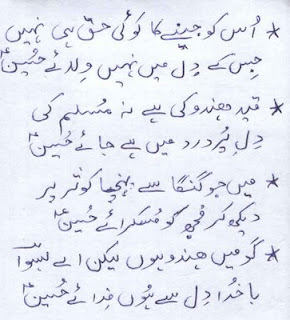 (Shajara-e-Tuba by Mohammed Mahdi Haaeri, Vol. 1, Pg. 3) The Oppressed People of Najran Mourning entails a narration of the heart-shattering oppression and atrocities inflicted upon the Ahle Bait (a.s.) and their subsequent sorrows. At the same time, it also means detailing those who actually committed these oppressions and those who subjected the Ahle Bait (a.s.) to such difficulties. The Holy Quran, at various places, has mentioned the history of those believers who were victims of oppression and has detailed their martyrdom. This implies that narrating the incidents of martyrdom of those who were subject to oppressions is a divine practice embodied in the Holy Quran. Since these incidents are enumerated in the Holy Quran and given that it is recommended to recite the Holy Quran daily, the narrative of these incidents will be repeated day after day, every single day. If the Holy Quran orders the recitation and daily remembrance of martyrs, then the tragedies concerning the one who is the leader of the youth of paradise; in whose veins flows the pure blood of the Holy Prophet of Islam Hazrat Mohammed Mustafa (s.a.w.a. ); the one whose happiness was the happiness of the Prophet (s.a.w.a. ); and whose sorrow was the sorrow of the Prophet (s.a.w.a. ), should certainly be given added significance and importance. The rationale for Azadaari is simply the same as the one for remembering these Quranic incidents every day. These Quranic incidents will be remembered till the Holy Quran exists. Likewise, the mourning for Imam Husain (a.s.) will continue until the end of time. The recitation of the Majestic Quran is a cause of reward and forgiveness for our sins. Similarly, mourning for Imam Husain (a.s.) leads to immense rewards and an excellent way for the forgiveness of our sins. Here are some of the incidents in which the Noble Quran has remembered those who were oppressed and finally martyred in the way of Allah the High. The Holy Quran in Surah Buruj reminds us of the events, which befell a group of believers who were burnt alive by the ruler only because they were not prepared to surrender their belief of monotheism (Tauheed). Surah Buruj was revealed in Makkah. In Makkah, the believers were subjected to all kind of atrocities. Whosoever accepted Islam instantly faced the prospect of oppression at the hands of the infidels. The narration of such events in this Surah served an as encouragement and a lesson for the believers to remain firm on their belief even while faced with difficulties. In this Surah, Allah the High swears by four things before narrating the event. This itself emphasizes its importance and highlights the significance of narrating the difficulties faced by the believers. The verses of the Holy Quran are as follows: "I swear by the mansions of the stars. And the promised day. And the bearer of witness and those against whom the witness is borne. Cursed be the makers of the pit. Of the fire (kept burning) with fuel. When they sat by it. And they were witnesses of what they did with the believers. And they did not take vengeance on them for aught except that they believed in Allah, the Mighty, the Praised." (Surah Buruj:1-8) The incident is as follows: In Yemen, there was a king by the name of Zu Nuwas, from the family of 'Himyar'. He had adopted Judaism. The family of 'Himyar' too in deference of the king had accepted the Jewish faith. Some person informed the king that in Western Yemen, there was a family named ?Najran? that had reverted to the Christian religion. (It should be noted that this Christianity does not refer the Christianity that is practiced today. Rather, it refers to Christianity in its original form that believed in One God and not in Trinity. In addition, Islam had not yet been revealed and hence, Christianity had not been abrogated). The people of Himyar prepared the king to force the family of Najran to forsake Christianity and revert to the Jewish faith. Consequently, Zu Nuwas turned his attention towards Najran, presented the Jewish faith to them and applied pressure that they accept it. Despite this, the people of Najran did not yield and refused to submit to him. Zu Nuwaas then ordered the digging of a trench that was subsequently lit with fire. The believers of Najran were thrown into this trench and burnt alive. Some of them were massacred and cut to pieces. In this fashion, 20,000 believers were subjected to this oppression. (Tafseer-e-Namoonah, Vol. 26, Pg. 337-338 citing Tafseer-e-Ali Ibn Ibrahim Qummi, Vol. 2, Pg. 214) Imam Ali Ibn Abi Talib (a.s.) narrates an incident as follows: Allah the Almighty sent a Prophet for the guidance of the Ethiopians. However, they denied him. 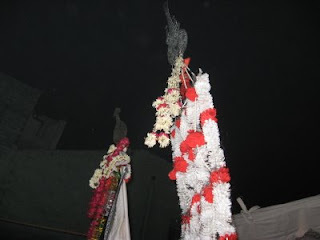 A bitter battle ensured in which many companions of the Prophet were martyred and the rest, including the divine Prophet, were captured and imprisoned. Thereafter, the people dug a trench and filled it with fire. The prisoners were then brought to the edge of the pit and it was said to them, "Those who follow our religion may step aside. However those who desire the new religion and seek to remain firm upon it should throw themselves into the fire." The Prophet and his loyal companions who observed this scene contemplated their options - on one hand was belief and the fire and the on other side was life, albeit with disbelief. They chose death over life in this world and sought preference over one another in jumping to their death in the fire. At that instant, a woman walked towards the fire with a one-month-old child in her arms. For a moment, she was overcome by emotion and looked with longing towards the child. She was reflecting upon her situation when the child in her arms spoke - "O mother! Do not be afraid and follow me into this fire. Indeed, this is a minor difficulty in the way of Allah." (Tafseer-ul-Meezan, Vol. 20, Pg. 377 taken from Tafseer-e-Namoonah, Vol. 26, Pg. 341). These narrations are not contradictory to each other. Rather they point to the fact that believers have often faced such difficult situations. Oppressors have tormented them and subjected them to untold hardships because of their firm belief and faith. The events of Karbala are even more tragic than the ones narrated above - the oppression inflicted upon Imam Husain (a.s.) and his companions by Yazeed the accursed and especially those upon his women. The narration of these difficulties is appropriate. This is because one should not see the severity of oppression by itself. Rather, such deeds need to be viewed in the light of upon whom it was committed. If one reflects upon the grand stature and merit of Imam Husain (a.s.), then there is no other event that can match the level of oppression that he was subjected to. Therefore, remembering the event of Karbala and remembering it regularly and repeatedly is an act that is liked by Allah. Since the recitation of the Holy Quran is generally done in a typical manner, the reciters of the Noble Quran pass by this incident like the other verses of Holy Quran without paying attention to their meaning. When those who recite these verses, keep in mind their significance, then surely their hearts would be affected by it. The End for the Oppressors In this Surah, where Allah the Almighty has narrated the tragic account of the victims, He has also described the painful end for the oppressors. At the outset, the following points have been conveyed, "Whose is the kingdom of the heavens and the earth; and Allah is a Witness of all things." (Surah Buruj:9) After this, Allah, the Almighty indicates, "Surely (as for) those who persecute the believing men and the believing women, then do not repent, they shall have the chastisement of hell, and they shall have the chastisement of burning." (Surah Buruj:10) This means that rulers and tyrants should not be in the delusion that their kingdom will last forever and they can continue to do whatever they like. For, this is not a permanent option for them. The kingdom of Allah encompasses everything and He is a witness to their deeds. If they do not repent, regret their actions and seek forgiveness, then they will face the fire of Hell. After this, the discussion about the burning draws our attention to the fact that just as these oppressive rulers threw believers into the burning fire; in a similar fashion, they too will be thrown into the blazing fire of Hell. The only difference being that while in this world, the believer's agony will end with his martyrdom; the chastisement of Hell will last forever. The Reward for the Oppressed In this Surah, Allah the Almighty has not just described the painful end for the oppressors, but has also given glad tidings of the rewards that await the victims of oppression. "Surely (as for) those who believe and do good, they shall have gardens beneath which rivers flow; that is the great achievement." (Surah Buruj:11) In the above verse, Allah the High has not just made a mention of paradise but has also called it a great success and achievement. This is the result of being patient upon the difficulties encountered in the way of Allah. The purpose of the Majestic Quran in narrating this event is not that it be read as a historical narrative. Rather the objective is that one, after reading this event, develops an empathy with the oppressed and disgust for the oppressors. The Distress of Hazrat Yusuf (a.s.) Allah the Almighty has described the events of the life of Hazrat Yusuf (a.s.) in the Holy Quran as "the Best of the Narratives". "Certainly in Yusuf and his brothers there are signs for the inquirers." (Surah Yusuf:7) At the beginning of the Surah, Allah has made a mention of the signs, and towards the end of the Surah, Allah informs us - "In their histories there is certainly a lesson for men of understanding. It is not a narrative which could be forged, but a verification of what is before it and a distinct explanation of all things and a guide and a mercy to a people who believe." (Surah Yusuf:111) In this Surah, there is a mention about the oppressions that were perpetrated upon Hazrat Yusuf (a.s.) by his brothers. It also mentions the causes that led to these oppressions. The Surah also outlines how the brothers of Hazrat Yusuf (a.s.) persevered to ensure that the memory of Hazrat Yusuf (a.s.) and the oppressions inflicted upon him be obliterated from the minds of the people. While it is not our objective to narrate the entire incident, it will suffice to point out that it is the style of Holy Quran to narrate the oppressions that were committed upon the Prophets sent by Allah. Moreover, not just narrate the events, but to narrate them repeatedly. Hence we can conclude that whenever tragic events occur and injuries are inflicted upon the divine representatives of Allah, it is the duty of Muslims to ensure that these tragedies are remembered and repeated with regularity so that their memories remain fresh in our hearts and minds. Do pay attention to the following verses of the Holy Quran - "Slay Yusuf or cast him (forth) into some land, so that your father's regard may be exclusively for you, and after that you may be a righteous people. A speaker from among them said: Do not slay Yusuf, and cast him down into the bottom of the pit if you must do (it), (so that) some of the travelers may pick him up. They said: O our father! What reason have you that you do not trust in us with respect to Yusuf? And most surely we are his sincere well-wishers: Send him with us tomorrow that he may enjoy himself and sport, and surely we will guard him well. He said: Surely it grieves me that you should take him off, and I fear lest the wolf devour him while you are heedless of him. They said: Surely if the wolf should devour him notwithstanding that we are a (strong) company, we should then certainly be losers. So when they had gone off with him and agreed that they should put him down at the bottom of the pit, and We revealed to him: You will most certainly inform them of this their affair while they do not perceive." (Surah Yusuf:9-15) The verses following these outline the events of the life of Hazrat Yusuf (a.s.) - the event where he was sold in the markets of Egypt, the craftiness of Zulaykha and his subsequent imprisonment. If the account of Hazrat Yusuf (a.s.) is the "Best of the Narratives", then surely the mourning upon the tragedies that befell Hazrat Imam Husain (a.s.) is the "Best Mourning". Surely in this are signs and learning for men of understanding. Hazrat Yaqub (a.s.) was aggrieved upon the separation from his son Hazrat Yusuf (a.s.). When his sons returned from their travels and did not bring any news of Hazrat Yusuf (a.s.), the Noble Quran has narrated the condition of Hazrat Yaqub (a.s.) and the dismissal of this display of grief by his sons as follows - "And he turned away from them, and said: O my sorrow for Yusuf! And his eyes became white on account of the grief, and he was a repressor (of grief)." (Surah Yusuf:84) Such was the condition of Hazrat Yaqub (a.s.) that he constantly remained in a state of grief and spent much of his days lamenting the separation from his son. Needless to say, his sons i.e. the brothers of Hazrat Yusuf (a.s.), were unhappy with this for as much as Hazrat Yaqub (a.s.) expressed his sorrow, their shameful deed became all the more clear for the people. Hence they expressed their displeasure such - "They said: By Allah! You will not cease to remember Yusuf until you are a prey to constant disease or (until) you are of those who perish. He said: I only complain of my grief and sorrow to Allah, and I know from Allah what you do not know." (Surah Yusuf:85-86) This clearly indicates that the expression of one?s sorrow is amongst the best ways to present oneself before Allah. It is for this reason that the religious scholars have ordained that mourning for Imam Husain (a.s.) is the "Best Medium". This incident also highlights the fact that to cry for the sake of the calamities of others to such an extent that one loses the whiteness of one?s eyes is the custom of the Prophet of Allah. It emphasizes the extent to which one should be aggrieved for the sake of the tragedies that befell Hazrat Imam Husain (a.s.). To seek closeness to Allah through the sorrow of his divine representatives is also amongst the customs of the Divine Emissaries (peace be on them all). Although the Holy Quran chronicles numerous acts of injustice like the incident of Hazrat Haabeel (a.s.) and Qaabeel, the atrocities on the Prophets (a.s.), the episode of Hazrat Ibrahim (a.s.) being thrown into fire and many others, we shall suffice with the ones mentioned above. These incidents which are found in the Holy Quran prove that it is a Quranic practice to relate the cruel treatment meted out to the oppressed ones. Holy Quran is recited in every house, so should these heartrending events be mentioned too. We would, in the end, like to point out that the difference between narrating the incident of Imam Husain (a.s.) and Hazrat Yusuf (a.s.) is same as that of the difference between their respective positions. 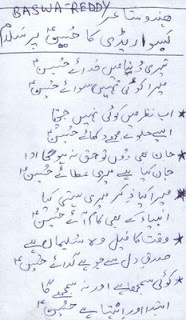 Hindu Poet Baswa Reddy Tribute to Imam Hussain a.s.
Karbala has the unique feature of having its name engraved in the memory of generations and all along the history of the Muslim world. Believers recall this name with sorrow and distress, for they remember the grand sacrifice of Imam Hussain, peace be upon him (a.s.), and his family members and friends. Up to this day, a huge number of devotees visit this holy place all year around to pay homage to the master of martyrs Imam Hussain (a.s.). Two main roads lead the visitor to Karbala. One is from the Iraqi capital Baghdad, through Al-Musails, and the other is from the holy city of Najaf. Upon reaching Karbala, the holy place would draw the visitor's attention to its glorious minarets and domes shining due to the light of its lord. Two grand holy shrines in Karbala are those of Imam Hussain (a.s.) and his brother Abul-Fazl al-Abbas (a.s.). Also present inside the shrine of Imam Hussain (a.s.) are the holy tombs of his two sons Hazrat Ali Akbar (a.s.) and 6-month old Hazrat Ali Asghar (a.s.) and his trusted friend Hazrat Habib ibn-e-Mazahir (a.s.). 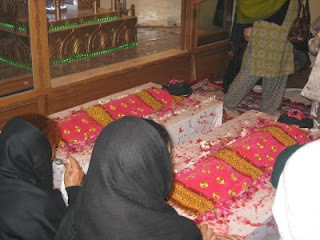 In one of the corners of the inside area of the shrine, is the Ganj-e-Shuhada where bodies of all the 72 martyrs of Karbala are buried. Next to one of the entrances "Bab-ul-Dhahab" , is the Qatl-gah, where the actual martyrdom of Imam Hussain (a.s.) took place. 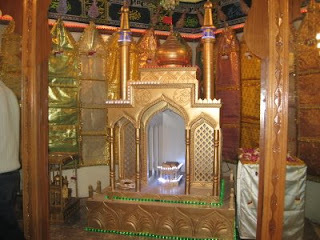 All the tombs and shrines are beautifully decorated with golden windows and beautiful illumination. "Karbala" Origin & Meaning There are many opinions among different investigators, as to the origin of the word "Karbala". 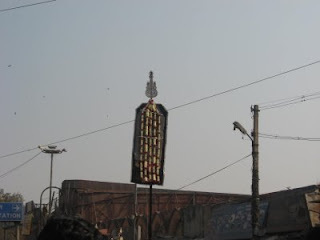 Some have pointed out that "Karbala" has a connection to the "Karbalato" language, while others attempt to derive the meaning of word "Karbala" by analyzing its spelling and language. They conclude that it originates from the Arabic word "Kar Babel" which was a group of ancient Babylonian villages that included Nainawa, Al-Ghadiriyya, Karbella, Al-Nawaweess, and Al-Heer. This last name is today known as Al-Hair and is where Imam Hussain's (a.s.) grave is located. The investigator Yaqut al-Hamawy had pointed out that the meaning of "Karbala" could have several explanations, one of which is that the place where Imam Hussain (a.s.) was martyred is made of soft earth - "Al-Karbalat". Other writers made the connection between the name and the disastrous event which painted the desert with blood, and so the word "Karbala" was said to compose of two Arabic words: "Karb" meaning grief and sorrow, and "Balaa" meaning affliction. Such a connection, in fact, has no scientific evidence, since Karbala was known as such even before the arrival of Imam Hussain (a.s.). Martyrdom and popularity Karbala was at first an uninhabited place and did not witness any construction activity, although it was rich in water and its soil fertile. 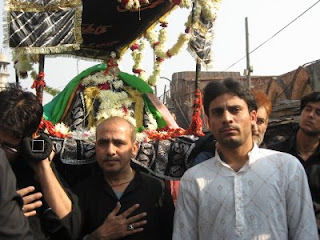 Following the tenth of Muharram 61 AH (680 AD), after the martyrdom of Imam Hussain (a.s.), people from far as well as tribes living nearby started visiting the holy grave. A lot of those who came, stayed behind and/or asked their relatives to bury them there after their demise. Despite many attempts by successive rulers, such as Al-Rashid and Al-Mutawakkil, to put a restriction on the development of this area, it has nonetheless spread with time to become a city. Bounty of visiting Imam Hussain(a.s.) shrine There is a lot of benefit and great spiritual reward in visiting the grave of Imam Hussain (a.s.). The Prophet Mohammad (saws) has said of his grandson Imam Hussain (a.s.): "Hussain is of me and I am of him". Several narrations mention that visiting the grave of Imam Hussain (a.s.) relieves one of worldly afflictions as well as those after death. Believers, therefore, come from all parts of the world all year round to receive the honor, particularly during the first ten days of Muharram (Ashura) and the twentieth of Safar (the fourtieth). One common Iraqi custom during that season is to go walking from Najaf to Karbala, reflecting their strong adhesion to and adoption of the morals and principles for which Imam Hussain (a.s.) struggled and attained martyrdom. Mausoleum of Imam Hussain(a.s.) The historian Ibn Kuluwayh mentioned that those who buried Imam Hussain (a.s.) made a special and rigid construction with signs above the grave. Higher and bigger constructions above the grave started during the ruling of Al-Saffah, but Harun al-Rashid later on, put heavy restrictions to prevent people from visiting the grave. At the time of Al-Mamun, construction around the grave resumed until the year 236 AH when Al-Mutawakkil ordered the destruction and digging of the grave, and then filling the pit with water. His son, who succeeded him, allowed people to visit the grave site, and since then building the precinct to the grave increased and developed step by step. On the other hand, the historian Ibn Al-Athir, stated that in the year 371 AH, Aadod Al-Dawla Al-Boowayhi became the first to largely lay the foundations for large scale construction, and generously decorated the place. He also built houses and markets around the precinct, and surrounded Karbala with a high boundary wall turning it into a strong castle. In the year 407 AH, the precinct caught fire due to the dropping of two large candles on the wooden decorations, but Hasan ibn Fadl (the state minister) rebuilt the damaged sections. History has recorded the names of several rulers who shared the honour of widening, decorating or keeping the precinct in good condition. Amongst them is Fateh Ali al-Qajari, who in 1250 AH ordered the construction of two domes. 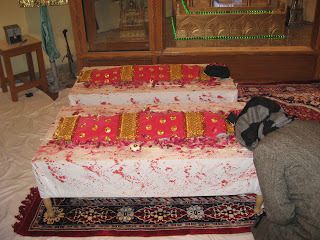 One over Imam Hussain's(a.s.) grave and the other over his brother Abul-Fazl al-Abbas(a.s.). The first dome is 27 meters high and completely covered with gold. At the bottom, it is surrounded with 12 windows, each of which is about 1.25 m away from the other, from the inside, and 1.30 m from the outside. The mausoleum has an area of 59 m / 75 m with ten gates, and about 65 rooms, well decorated from the inside and outside, used as classrooms for studying. As for the grave itself, in the middle of the precinct, it is called the "Rawda" or garden and it has several doors. The most famous one is called "Al-Qibla" or "Bab al-Dhahab". 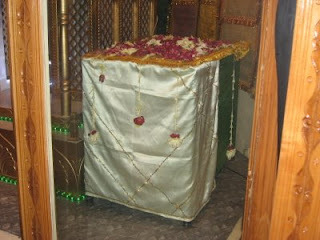 When it is entered, one can see the tomb of Habib ibn Madhahir al-Asadi (a.r.). Habib was a friend and companion of Imam Hussain (a.s.) since their childhood. He was one of those who was honoured with martyrdom at the battle of Karbala. The resting place of Abul-Fazl al-Abbas(a.s.) Abul-Fazl al-Abbas (a.s.) was the brother of Imam Hassan (a.s.) and Imam Hussain (a.s.) and the standard-bearer of Imam Hussain (a.s.) in the battle of Karbala. He is well known in history for his valour, loyalty and similarity to his father, the Lion of God, Imam Ali (a.s.). 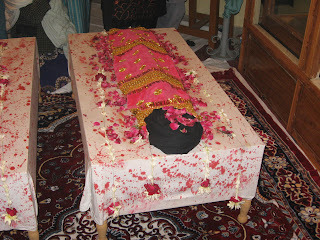 The grave of Hazrat Abbas (a.s.) received similar attention as that of Imam Hussain (a.s.). In the year 1032 AH, the King Tahmaseb ordered the decoration of the grave's dome. He built a window on the 'darih' around the grave and organized the precinct. Other similar activities were done by other rulers. 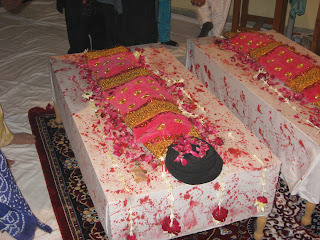 Chronology of Imam Husayn's Shrine at Karbala 61 AH lst October, 680 Imam Hussain(a.s.) was buried at this sacred spot. 65 AH 18th August, 684 Mukhtar ibn Abu Obaidah Thaqafi built an enclosure around the grave, in the form of a mosque and erected a dome over the grave. There were two entrances to this building. 132 AH 12th August, 749 A roof was built over a part of this mosque and two entrances were added during the reign of as-Saffah. 140 AH 31st March, 763 The roof was demolished during the reign of al-Mansur. 158 AH 11th November, 774 During the reign of Mahdi the roof was reconstructed. 171 AH 22nd June, 787 During the reign of Al-Rashid the dome and the roof were demolished and the plum tree which stood near the grave was cut down. 193 AH 25th October, 808 During the reign of Amin the building was reconstructed. 236 AH 15th July, 850 Mutawakkil demolished the buildings and ordered that the land should be ploughed. 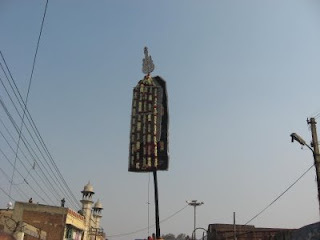 247 AH 17th March, 861 Muntasir built a roof over the grave and set up an iron pillar near it, to serve as a landmark for the pilgrims. 273 AH 8th June, 886 The roof was demolished again. 280 AH 23rd March, 893 The Alid representative built a dome in the centre, with two roofs, on either side and an enclosure with two entrances. 307 AH 19th August, 977 Adzd ibn Boweih rebuilt the dome, the surrounding galleries and constructed a screen of teak wood around the sepulchre. He also constructed houses all round the shrine and erected the boundary wall of the city. At the same time Imran ibn Shahin built a mosque adjacent to the tomb. 407 AH 10th June, 1016 The buildings were damaged by fire and the Vizier, Al-Hasan ibn al Fadi rebuilt them. 620 AH 4th February, 1223 Nasir le-din-Illah reconstructed the screens of the sepulchre. 757 AH 18th Sept. 1365 Sultan Owais ibn Hasan Jalairi remodelled the dome and raised the walls of the enclosure. 780 AH 24th Feb. 1384 Ahmad ibn Owais erected two minarets covered with gold and extended the courtyard. 920 AH 26th Feb. 1514 When Shah Ismail Safawi visited the holy shrine he built a sacrophagus of the inlaid work over the grave. 1032 AH 5th Nov. 1622 Shah Abbas Safavi constructed the screens (darih) of brass and bronze and decorated the dome with Kashi tiles. 1048 AH 15th May 1638 Sultan Murad IV, when he visited the holy shrine, whitewashed the dome. 1155 AH 8th March 1742 Nadir Shah visited the holy shrine and decorated the building and offered valuable presents to the treasury of the shrine. 1211 AH 7th July 1796 Shah Muhammad Qachar covered the dome of the shrine with gold. 1216 AH 14th May, 1801 Wahhabis attacked Kerbala, spoiled the screens and portico and looted the shrine. 1232 AH 21st Nov., 1817 Fateh Ali Shah Qachar repaired the screens and plated them with silver. He also plated the centre of the main portico with gold and repaired the damage done by the Wahhabi robbers. 1283 AH 16th May, 1866 Nasiruddin Shah Qachar extended the courtyard of the shrine. 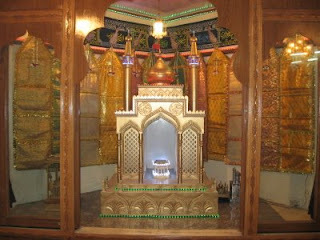 1358 AH 21st February, 1939 Dr. Taher Saifud-din, 51st Dai-el-Mutlaq of the Dawoodi Bohra community offered a set of screens of solid silver which are fixed in the shrine. 1360 AH 29th January, 1941 Dr. Taher Saifud-din, 5lst Dai-el-Mutlaq of the Dawoodi Bohra community rebuilt the western minaret. 1367 AH 20th Dec., 1948 Syed Abdul Rasul Khalsi, Administrator of Karbala acquired the houses in the neighbourhood of the courtyard according to the price fixed by the government, to build a road around the holy mausoleum and to extend the courtyard. 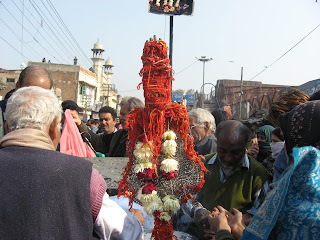 On 10th Muhramme Shia Community of Delhi and nearby city bringout procession of Alam, Zuljanah. 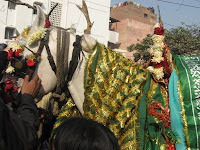 This procession started from Shia Jamamasjid at Kashmirigate, Delhi and reached at Dargah Panja Sharif. 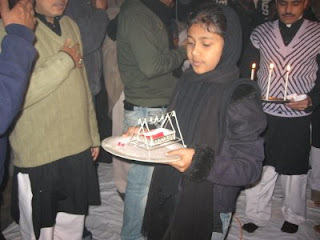 Lacs of shia men, women and kids were in procession. Main attraction was kama matam by anjuman of Kargil. All photos by Syed Rajat Abbas Kirmani. 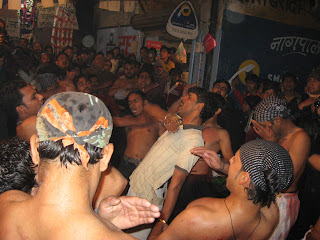 भारत की राजधानी दिल्ली में 8 जनवरी 2009 को 10वीं मोहर्रम का जुलूस एक बार फिर से लोगों के आकर्षण का केंद्र बना। इस जुलूस में दिल्ली और आसपास के शहरों के लाखों शिया युवक, महिलाएं और बच्चे शामिल थे। यह जुलूस कश्मीरीगेट स्थित शिया जामा मस्जिद से शुरू होकर दरगाह पंजाशरीफ तक पहुंचा। इस दौरान करगिल की अंजुमन का कमा का मातम जो देखता था, दांतो तले अंगुली दबा लेता था। दरगाह में हर रोजे पर कर्बला के शहीदों को नम आंखों से याद करने वालों की लंबी लाइनें देखी गईं। अगर आप इससे संबंधित विडियो देखना चाहते हैं तो यूट्यूब डॉट कॉम पर जाकर विडियो देखने के लिए अजादारी इन दिल्ली टाइप करें। वहां आप सारे विडियो देख सकते हैं और कई नौहे भी सुनने को मिल सकते हैं। इन फोटोग्राफ को आप तक सैयद रजत अब्बास किरमानी ने पहुंचाया है। Shia people bringout Taboot of Imam Hussain a.s. People offering duas and prayers. 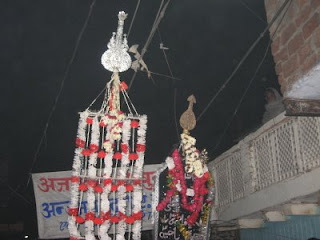 The big Alam in procession. Another view of Alam. 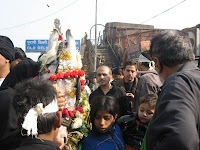 Matam of Kama in procession by Shia Youth. You can see bloods on their bodies. 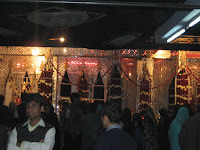 Shia people inside Dargah Panja Sharif. 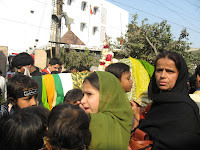 Shia women participation was very much visible in this procession. 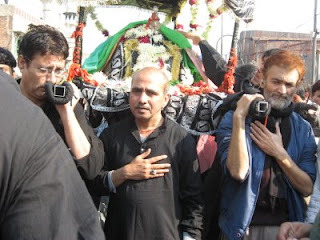 Shia people paying tribute to Zuljanah. 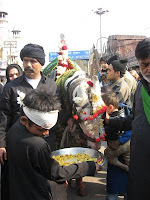 A horse on this name was true companion of Imam Hussain. Shia people gatthered in large numbers near Zuljanah. Shia people offering prayers near Zuljanah. 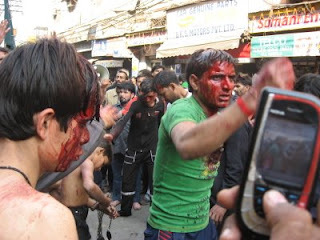 Grieved Shia people in procession. Shia women expressing their grief on the Shabeeh.